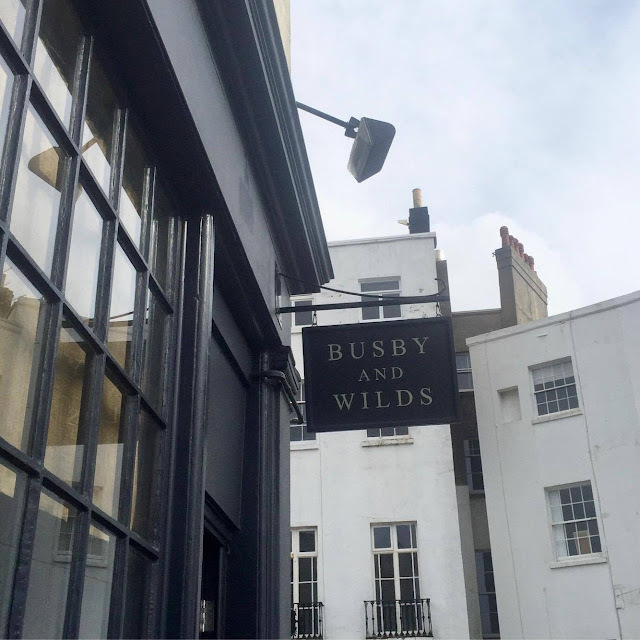 Of all the many, many Brighton and Hove restaurants I eat at, Busby & Wilds holds a soft and squishy place within my heart. 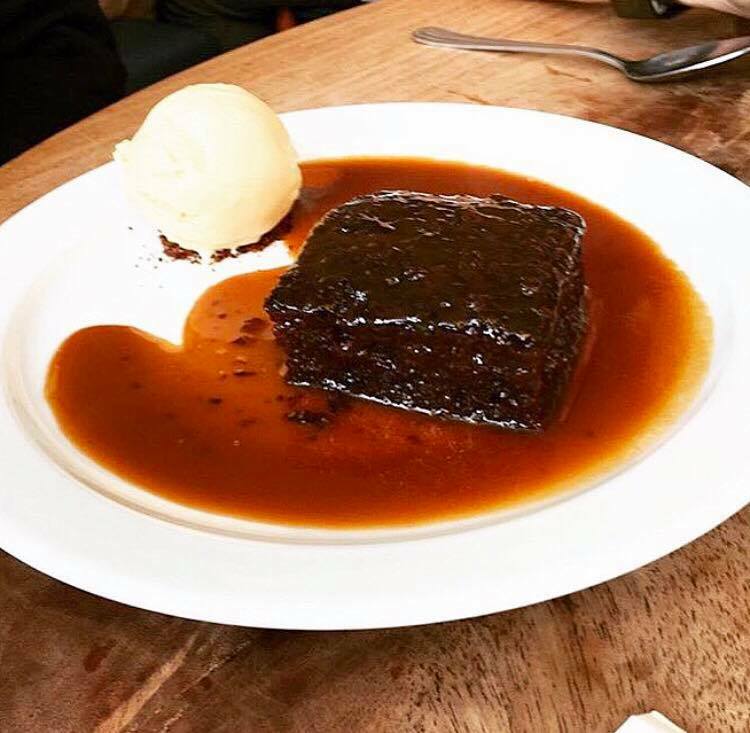 It’s (extremely) local to my flat, the owners and their team couldn’t be more lovely, and their ever-pleasing menus are just full of the kind of food I want to eat, again and again and again *repeat to fade out*. They don’t do any of the aggressive self promotion/navel gazing/courting of the Brighton food ‘scene’ that is so prevalent at the moment, and I like them all the more for it. For me, the food should always be more important than the theatre, and having eaten here at least a dozen times, this is very much the case. I had some pictures of the lovely interior of the restaurant, however, my phone seems to have eaten them. But if you imagine a muted colour palette with splashes of blue, lovely artwork and a slightly nautical feel, then it should give you a fair idea of the decor at Busby and Wilds. 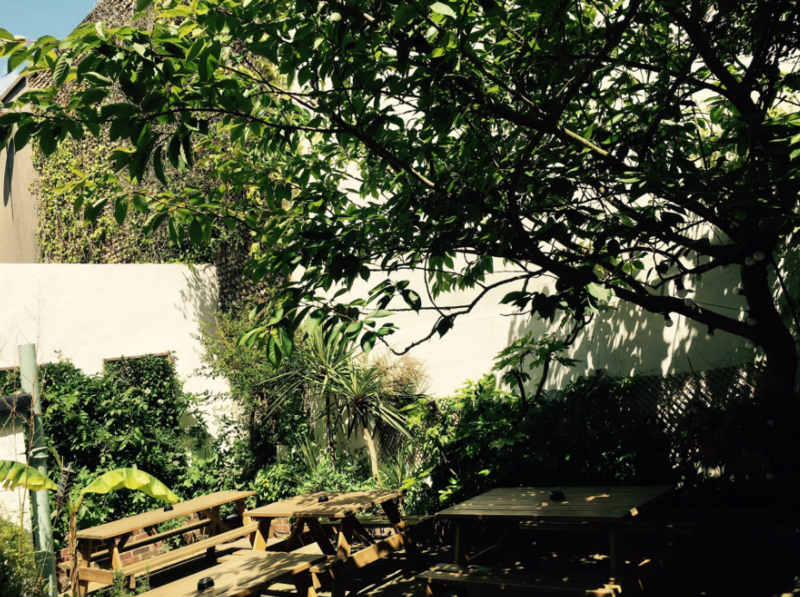 It glides seamlessly from a family-friendly lunch spot to a slightly smarter, more intimate-feeling space during the evening, and the garden space is absolutely gorgeous. 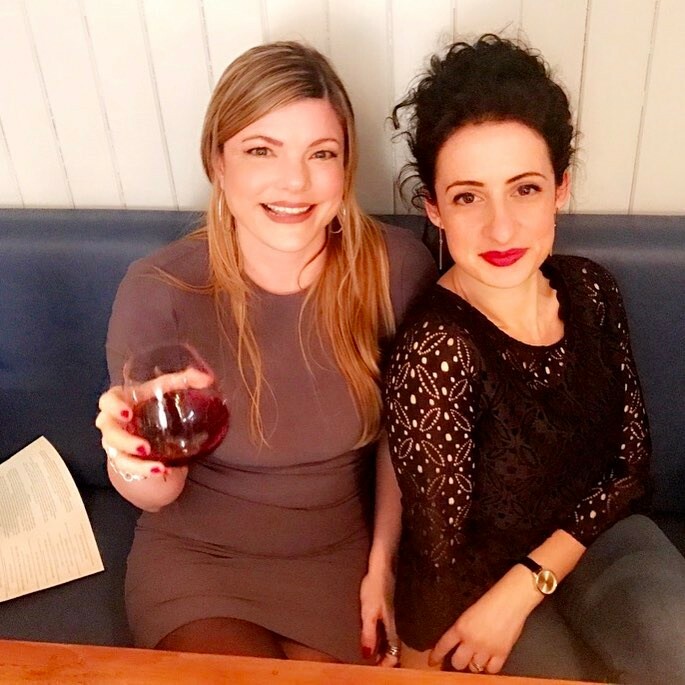 In addition to their extremely popular Sunday roasts, Saturday brunches, lunch and dinner menus, they’ve recently launched a monthly Supper Club at which I was thrilled to be their guest*, along with my partner in crime, Fran (The Graphic Foodie). Read her review here. 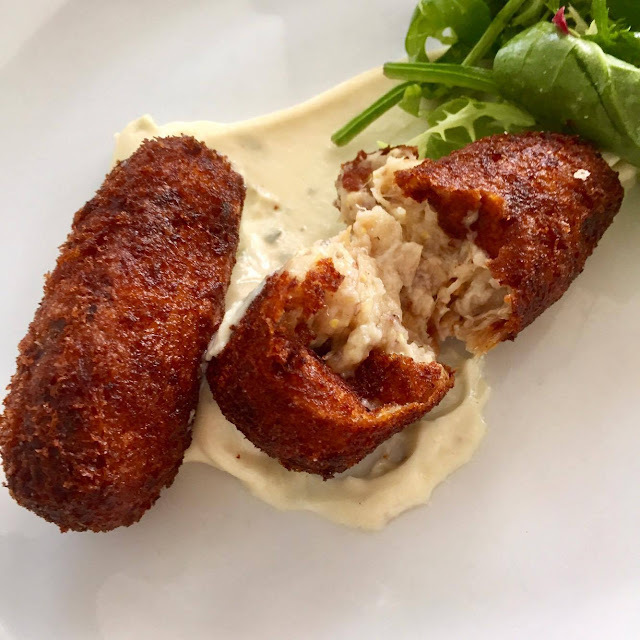 Suppliers for this menu included; Fin & Farm, Brighton & Newhaven fish, Natural Farms and High Weald Dairy. Lovely stuff! Note re wine matching: I’m no wine expert. I don’t drink it at home, I don’t order it in restaurants and much to my wine cellar owning parents’ despair, I don’t really enjoy or have any interest in it either. With this in mind there won’t be much, or any, comment throughout re the wine pairing. Just know that I drank every glass that was put in front of me, while Fran (far more of a wine buff) said it was one of the best wine flights she’s ever had – high praise indeed. After the five years (gulp) I’ve had my blog, I’ve been to a lot of supper clubs in various formats, my least favourite being the kind where I have to sit with a load of people I don’t know. (Flashbacks to the time my drunk friend massively insulted someone during the starter and we had to sit through another four courses.) With this memory playing out vividly in my mind, I was momentarily filled with horror as I was led to a table with about half a dozen strangers. Thankfully I needn’t have worried. Our fellow diners were a group of friends, food enthusiasts and, who strangely enough, all live in the same street as me. No inane small talk, interesting discussions about food, all in all a right laugh and something I will keep in mind the next time I find myself in a situation that is tweaking my socially-awkward reflex. 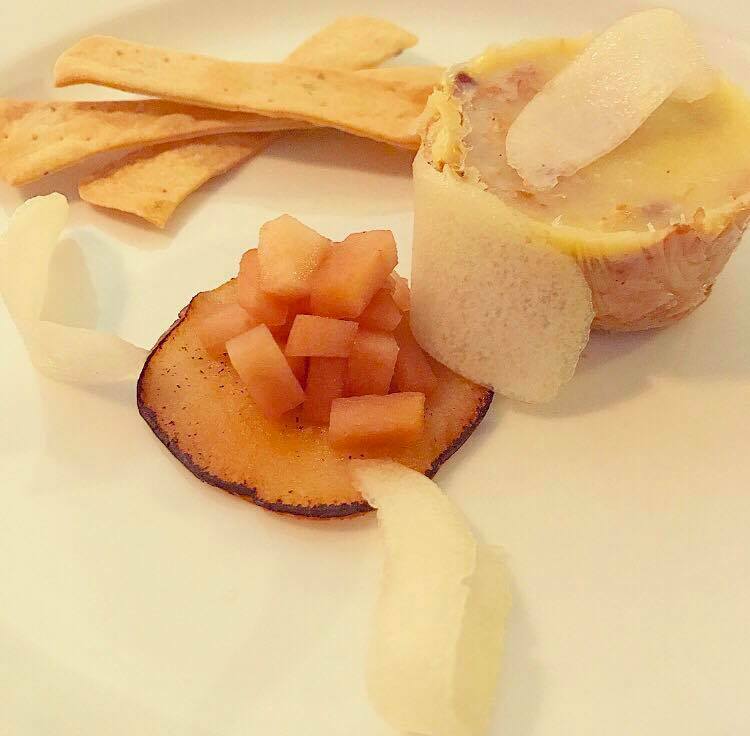 First up was Potted Wild Rabbit with pickled and candied pear and Shipton Mill crackers. I’m a fan of anything ‘potted’, because, let’s face it, enrobing almost anything in spiced butter is a win/win. 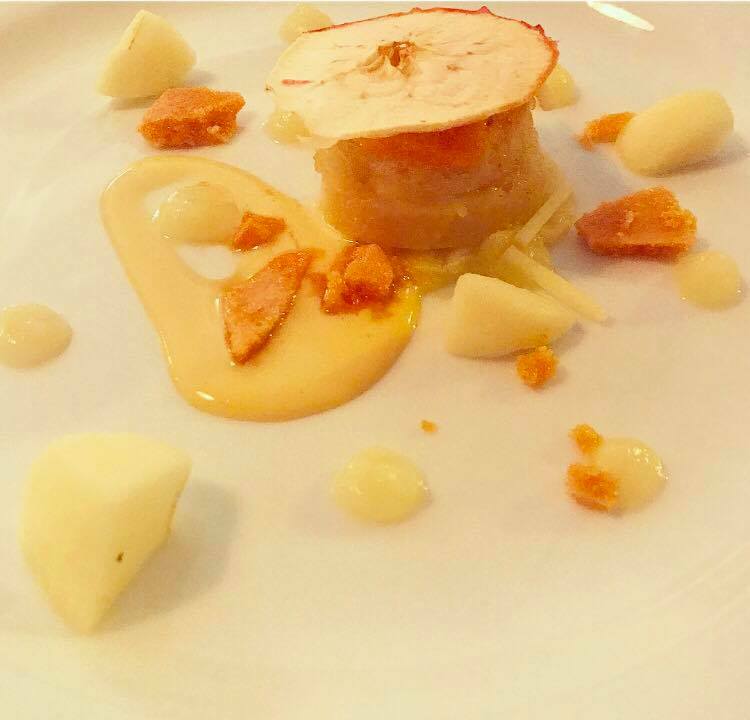 The sharpness of the pickled fruit cut through the rich, gamey meat, whilst the candied pear added another element of texture, bringing it all together with the crunchy crackers into a beautifully cohesive dish. An excellent kick off and made me excited for the rest of the meal. 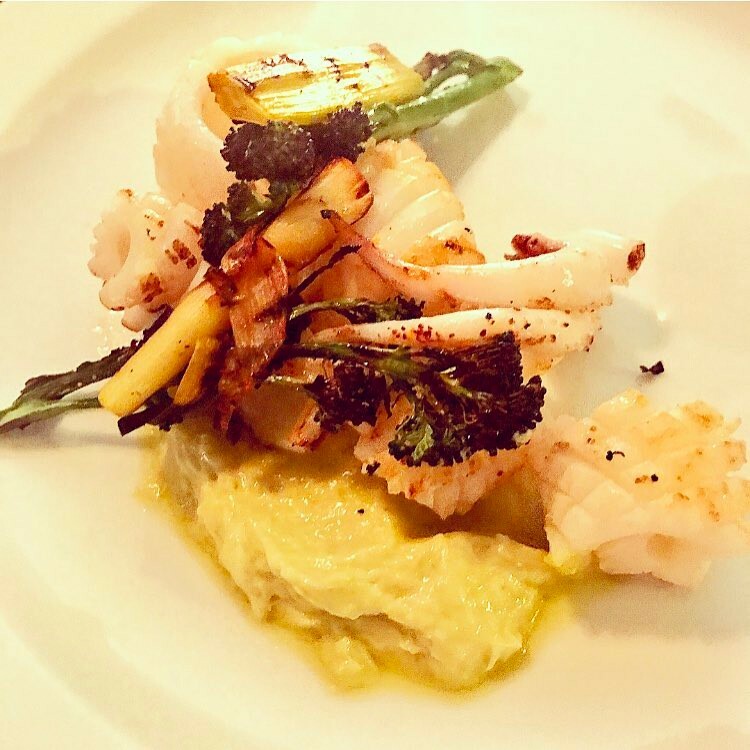 Beachy Head squid supplied by my favourite Brighton & Newhaven fish, served with Leek and Hemp Oil emulsion (grown in Arundel and cold-pressed by one of only eight licensed growers in the UK), and charred purple sprouting broccoli and baby leeks. Regular readers will know that if there’s squid on the menu, I will be ordering it. Mainly because I love it, but also because so many places overcook it in such a tragic fashion. I don’t use this word often, but it was perfect. Hands down, the best squid I’ve ever eaten. It had the consistency of al dente pasta, the emulsion was rich and creamy and the charred veg gave a nice, smokey kick to the otherwise delicate flavour line-up. 10/10 – I cannot praise it enough. 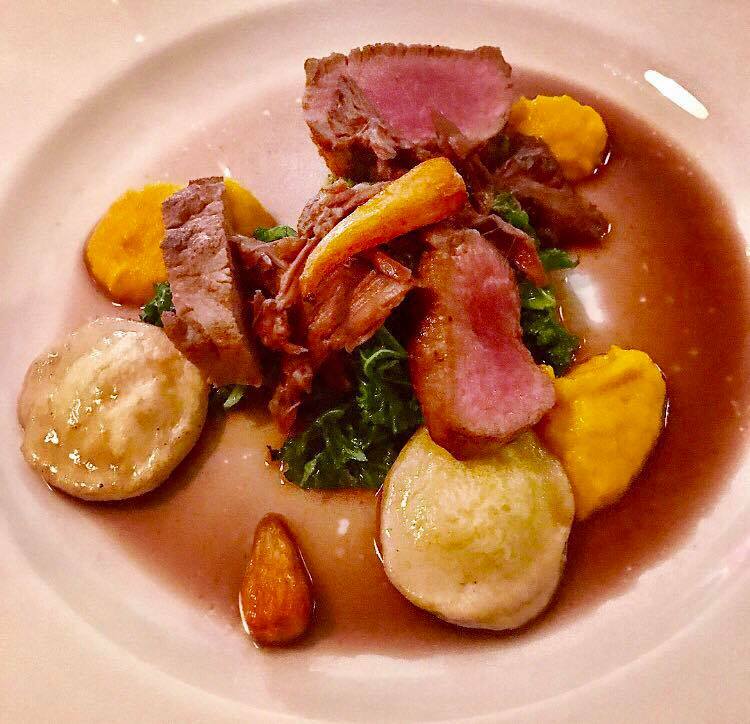 The lamb loin, which had been sourced from Brighton’s neighbouring South Downs, was served blushing and was incredibly tender. The dumplings were filled with minted ricotta and I thought were a lovely alternative carbohydrate element. If I had to level any sort of criticism at this course I’d say they were a little bit on the dense side, but this was only marginal. The carrot purée was flavoured with local ale, which was elevated to heavenly status when it had melted into the meat’s juices. The dessert was my least favourite course of the otherwise exemplary menu. 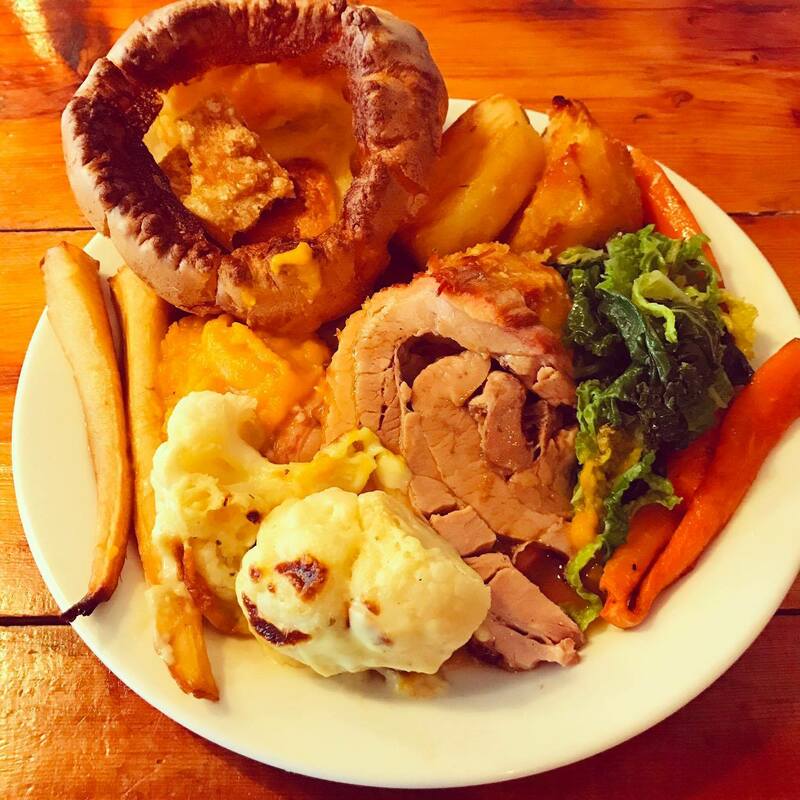 Its heart was very definitely in the right place, but the promise of 100% locally sourced ingredients made it too tricky a dish to execute with total success. Sugar was substituted for honey in the honeycomb, making it sticky rather than crunchy. My dentist would have been rubbing his greedy little hands together in glee had he witnessed me attempting to eat it. The Bread Pudding was fine, nothing incredible, but the (extremely pokey) plum and quince infused gin helped to liven things up a bit. I would like to stress though I, and everyone at the table, cleared their plates. All in all it was probably my best meal of the year so far and yet more proof that Busby & Wilds deserves a million more plaudits than it gets. SO many of the places I’ve eaten at could learn a great deal from them about quality, integrity and unshakeable consistency. 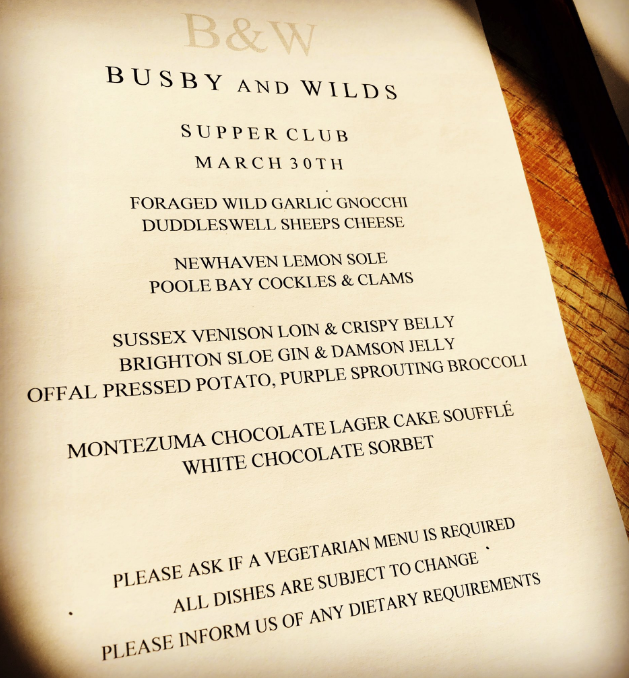 The line-up for next month’s Supper Club makes me want to go all over again. It reads beautifully and is exactly the type of food I want to be eating and would make a beeline for on any menu. 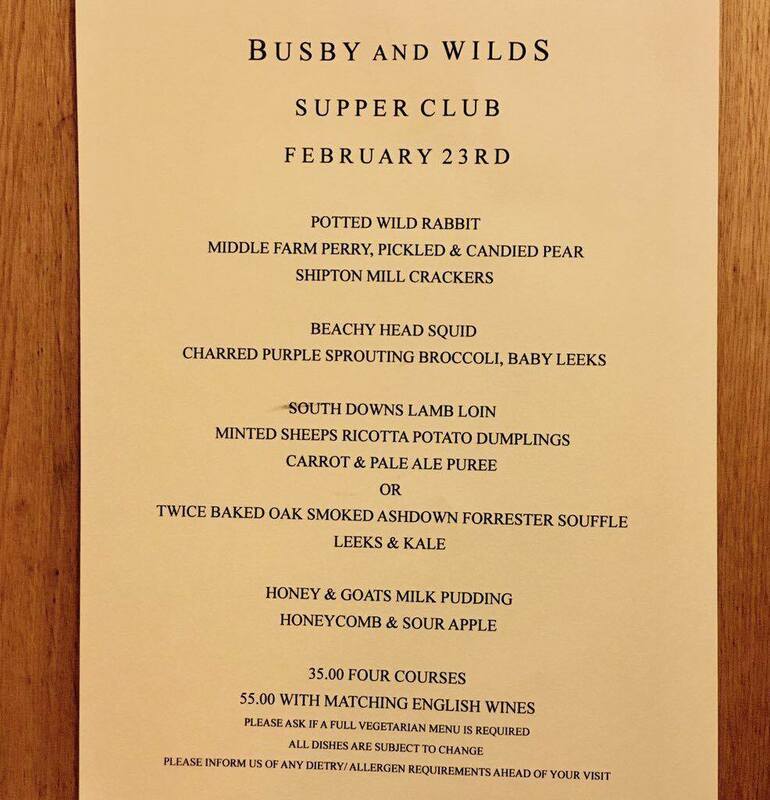 If you want to experience the Busby and Wilds supper club for yourself (and trust me, everyone should) they’ll be happening on the last Thursday of every month at £35 for four courses and £55 with a wine flight.